Nature Center, Prospect Park, Brooklyn, New York. Taking a step in every direction; going no where at all? This was a unique double staircase that disappeared through the circular arc to the second floor. I thought it was exquisite architecture, so unusual. 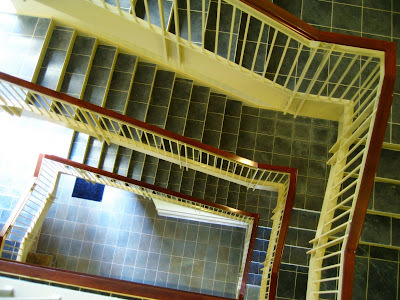 Spiraling staircase in Jamestown South dorm. College of William & Mary. The day Nyssa moved into the brand new dorm as a resident assistant, construction workers were busy unloading furniture, checking phone systems and various other last minute items. Scaffolding was still only partially taken down and the final cleaning had not yet been done. 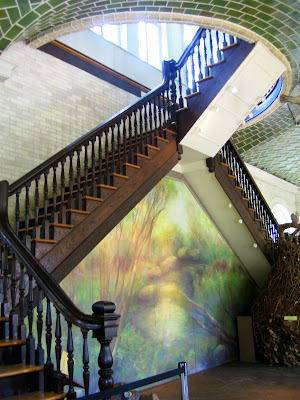 This wide open stairway compliments the elevator... YEAH!!!! Yes, there is an elevator.... great for the mom who has to deliver futons, computers, lamps and rugs to the fourth floor. I loved the fact that we were almost the first to use the stairs and I could picture all those smiling youthful faces as they greet friends returning from summer break. It did make me a bit dizzy as I hung over the railing with my camera, trying to get the right angled shot. Ohh! I must sit down! "Step into my parlor" said the spider to the fly. Ooooo! 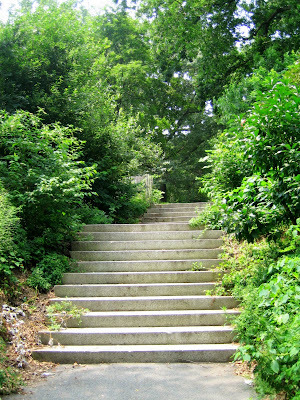 I call these my "secret garden" steps. No, we didn't take them to see where they went, somewhere very special I'm sure, but following them would have destroyed the mystery. And everyone must have some mystery in their life! Fantasy stairway to the stars. Local carousel. These steps speak of fantasy, elegance, the red carpet, celebrity, and believe it or not... life! Wouldn't it be nice if the steps we take in life were always brightly lit with lights to show us the right way to go? Never getting lost in the forests and dense underbrush of circumstance? Yes, I know... fantasy! 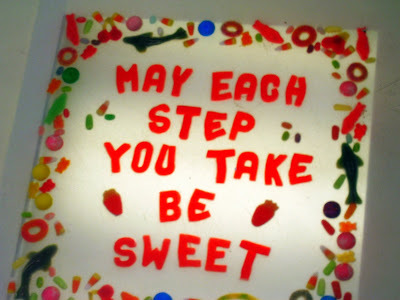 Finally, I leave you with this tile, appropriately, from a candy store..... stay sweet.... but not sappy! The theme for Saturday Photo Scavenger Hunt this week is "steps". You can go here to "Grab the Scavenger Hunt code" and here to join the blogroll. This really cute logo is available there as well. The link to other participants is in my blogroll on the sidebar.